In the cloud computing era, many organizations are driven to leverage SaaS for cost-saving reasons, but to implement solutions only offered by SaaS may limit application choices. In order to achieve profitability/ margin growth and cost reduction, financial executives must leverage solutions with the best features and functionalities that support their underlying business processes. 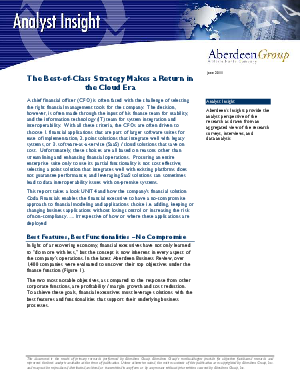 This research report by the Aberdeen Group takes a look at how financial executives can have a no-compromise approach to financial modeling and applications choice - by adding, keeping or changing business applications - without losing control or increasing the risk of non-compliancy, irrespective of how or where their applications are deployed.